On this five 5Day safari in Tanzania you will visit Ngorongoro Crater featuring one of the highest concentrations of game and arguably the densest population of predators and carnivores in Africa. Here you will witness an amazing spectacle of African wildlife – inside a self-contained world teeming with animals. Large section of the Serengeti National Park. The sight of one hundred thousand wildebeest and zebras crossing the grassland savanna is something to behold and is surely one of Africa’s natural wonders. However no matter what time of year you decide to visit the wildlife watching is superb. Tour type: Youth and Family, Nature& Wildlife, Extreme Sport. Availability 98% Sure, Book today. Language: You would have a guide who he is speaking One language among these (English, Italian, French, Spanish, and Germany). Transportation Method: Land cruiser/ Land rover, 4 by 4 cars models are available. Arrival at the Kilimanjaro International Airport CODE: JRO you will welcomed by ANAPA representative who will usher you into a waiting vehicle and transfer you to the Hotel in Arusha. Our representative will have a short safari briefing session with you at the Hotel and leave you to relax and have dinner.Hotel category, LUXURY: Mount Meru Hotel. COMFORT: Impala Hotel. EASY: Le Jacaranda Hotel. Breakfast at Hotel and early leaving to Serengeti, The Serengeti National Park is the second largest park in Tanzania and is about the same size as Hawaii. The southern part is dominated by grassland and is therefore good hunting ground for the cheetah, while to the north / western parts a more hilly tree savanna landscape dominates. Game driving on route to Lodge/Camp stay LUXURY: Serengeti Sopa Lodge or Serengeti Serena Lodge. COMFORT: Lobo lodge or Ikoma Bush Camp similar category. EASY: Camping at the Lobo public Campsite or Seronera similar category. The Serengeti migration is famous of up to one million wildebeest and two hundred thousand zebras. This migration has become to be known as the “Great wildebeest Migration” and each year this natural spectacle is guaranteed. This in itself sets the Serengeti aside as a unique place to watch and observe wildlife. Dinner& overnight will be served at Selected Hotel # 2Day. 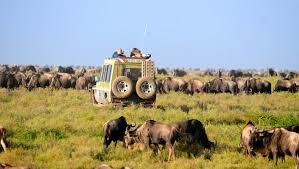 After breakfast you will continue your tour of the Serengeti National Park to Ngorongoro. On the way you will pass the Olduvai Gorge which became world known due to the archeological work of the English research couple Leaky. In the sixties here they found the oldest remains of prehistoric man and in a small museum nearby their work is documented (a visit is optional). As soon as the crater’s edge is reached you will have a superb view into the caldera. Overnight stay LUXURY: Ngorongoro Sopa Lodge or Ngorongoro Serena Lodge. COMFORT: Wildlife Lodge or Rhino Lodge similar category. EASY: Camping at Simba public Campsite. Day 5: Ngorongoro Crater- Arusha. Breakfast is at day break before you drive into the crater. The Ngorongoro crater is the largest unbroken and unflooded caldera in the world and will fascinate you with unbelieveable wildlife diversity. On the grass stepp and in the acacia tree woods you will find almost all species found on the east african savanna; with the exception of Topi, Masai Giraffe and Impala. Quite often you can observe the “Big Five” lions, elephants, buffalo, rhinoceros and leopards within a couple of hours. After an extensive wildlife tour and a picnic you will leave the caldera in the afternoon and drive back to Arusha. – Full board accommodation whilst on safari in the hotel category. o Tips and any items of personal nature.